My parents try to have all their kids come 'round the first Sunday of every month for dinner and a Family Night. We rotate assignments and my mom and I (and Mr Renn) take turns making proper Sunday suppers. March's get-together happened to fall on the eve of a hugely stressful business trip for my mom - and so she found herself scrambling to come up with a dessert that wouldn't require use of the oven (since we had a turkey kicking it in there in an attempt to free up freezer space). 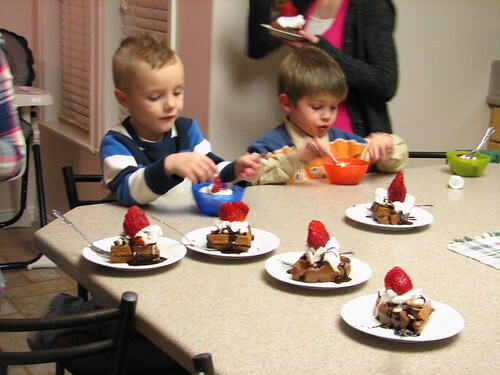 Who would have thought that would be the recipe for dessert perfection? Mr Renn suggested Waffles with icecream, such as we've adored at Zwahlens, then my mom perked up. "I've got a recipe for chocolate waffles!" Can you see the sublime direction this was headed? Chocolate Waffles from Annette Lyon's book .
" In a medium bowl, beat eggs, milk, oil, and vanilla; set aside. In a smaller bowl, combine dry ingredients. Add to wet ingredients and stir until blended. Beat for about a minute to give the eggs a little loft. Pour the correct amount into your waffle maker and cook until iron stops steaming. 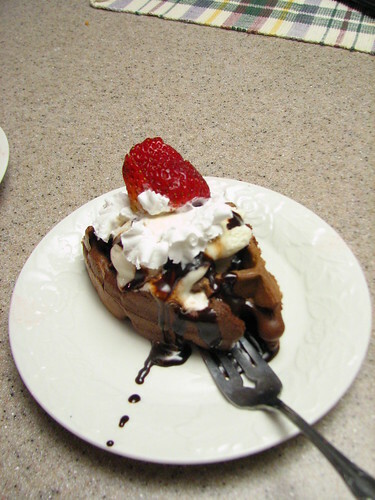 Makes about 8 small waffles"
Serve while still quite warm with ice cream, whipped cream, strawberries, and hot fudge sauce. Enter nirvana. Bring friends. And I have to say, there's nothing I love more than hanging out with all my family. My crazy brothers bring some awesome energy into the house. Because, no matter how old they get, it's pretty obvious they're still little boys inside. Those waffles look so tasty! Mmmm! I'll have to make some myself! Oh seriously...yummy! I am totally going to try making those. I'm a huge fan of mini chocolate chips in any type of carbohydrate breakfast, so these sound intriguing and delicious! Of course mine probably won't look as beautiful as yours did. ;) But I'm sure I'll enjoy eating them! And I should probably admit that I've never even ordered a waffle at Zwahlens. I know -- shocking! I'm a crepe person there. We miss you! YUM! thanks for posting the recipe! sounds divine! I can hardly get past the first sentence...every month you guys all get together?? That's just a piece of heaven! How wonderful!! And seriously, I have a pretty similar recipe and it is hands down our favorite dessert. We were in Philly a few days ago and I was sad as we drove past your exit. We're really, really missing you guys!